Ever want to live on a house boat? I would! 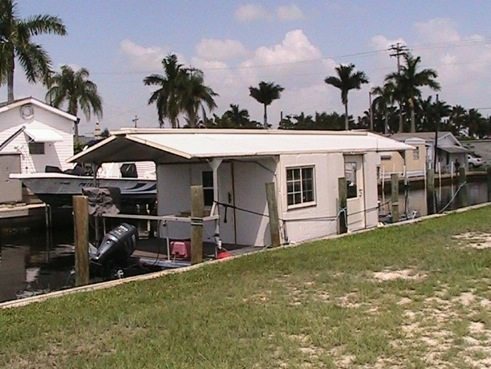 The picture is a really small pontoon houseboat that I ran into in Florida. It's too small for most people to live in so I assume it's just used for exploring and camping (there was a bed in there). With a new paint job and some touch ups it could actually look really nice. I'm sure it was custom made very inexpensively. Life on the water has always had its appeal to me. Plus the ability to change up the scene at any given moment if I wanted to just sounds awesome. Like RV living, but on water. I imagine this life to be that similar to living in an RV or really small house. That means cleaning the house would be quick because there isn't much space. You can live in an area that's close to all of the fun places in town because you'd be right on the docks where there are usually great restaurants, stores, hangouts, and tourist attractions. Although it sounds amazingly fun, it's not something I'd do for a long period of time. I just enjoy trying different things. In the end my dream lies within a small house near the ocean.